Her comments caught my attention. I have to confess to using the 'non-lawyer' word frequently when I write and speak. I haven’t thought twice about using it, nor did it occur to me it might be a disrespectful term...probably because I didn't intend to be disrespectful. 'Non-lawyer' was an easy way to categorize everyone in the law office who wasn’t licensed to practice law. I was just as quick to refer to 'non-lawyers' as legal staff or legal support staff or, simply, support staff...or to use their titles: receptionist, legal secretary, legal assistant, paralegal, paralegal manager, etc. My distaste for the word goes way back to before I earned my law degree, when I served as a legal secretary, paralegal and law office manager. I learned that more than a few attorneys treated support staff disrespectfully and like second class citizens. And all these years later, I'm still very alert to anything and everything that shows disrespect to our support staff members. Because of my years as a staff member and because of those legal assistants I've had the pleasure to know and work beside since, I have the utmost respect and appreciation for these critical legal team members. They play an enormous role in the building and maintaining of lawyers' and law offices' success stories. The truth is -- whether we like it or not -- the old two tier structure is indeed alive and well in too many law offices (attorneys who see themselves way up 'there' on a pedestal and all the 'n-ls' waaaaay down the ladder beneath the lofty esquires and 'esquettes"). It's in these toxic offices where those in authority falsely begin to think (and act) like they are somehow better than their lowly underlings. This form of arrogance and the "I'm better than you" attitudes wreak havoc for workplace morale, productivity and stability." I have to admit to being very slow to be offended by anyone and that usually serves me well. I won't be going to anger management classes any time soon. Much rolls off my back, although anyone who says they're 'certified' when they really have a 'certificate' can really irritate me. The same goes for people who refuse to acknowledge that the terms paralegal and legal assistant are synonymous. Unfortunately we're losing that battle. But non-lawyer? I hadn't given that much thought and I certainly hadn't thought to be offended by it. Nancy is right, though. Do doctors refer to their staff as non-doctors? Do CPA's refer to their staff as non-CPA's? Are there non-veterinarians, non-architects, non-judges, non-dentists, non-teachers? In no other profession are members given a title with 'non' attached to it. Is it a little like calling ourselves 'non-professionals' or even worse, labeling ourselves "not as valuable"? Maybe Shakespeare was right and the issue is silly. "What's in a name? That which we call a rose by any other name would smell as sweet." But maybe he's wrong, and casually throwing around the label 'non-lawyer' instead of the correct job title stinks. The term 'non-lawyer' does not accord the many well-educated and experienced legal professionals without law degrees that are essential to the practice of law - legal secretaries, law librarians, IT specialists, investigators, law office managers, court reporters, legal marketers, videographers and paralegals to name a few - the appropriate recognition or respect that they deserve for their unique skills and training and invaluable contributions to the legal field. Is it all in the context...or in the attitude? Example: If an attorney is kind to staff but calls them non-lawyers, it doesn't matter but when the belligerent person (and it doesn't necessarily have to be an attorney) sneers and calls someone a non-lawyer (meaning 'you are the bottom of the barrel around here'), it's unacceptable. So although it's certainly not everyone who uses the 'n-l' word with a negative intent, why use it at all when there are so many other more respectful words from which we can choose (e.g. legal or law office staff members, legal staff personnel, legal assistants, support staff, etc.!)? So the point of taking the time to share my thoughts on this subject...is to ask you to join me in finding other words that are far more respectful when we are talking about folks who are not licensed to practice law. Just think of the looks I'd get from the receptionist at an accountant's office if I were to ask, "Are you the non-CPA? Or, when calling my doctor's office I said, "Hi, I'd like to speak with a non-doctor." If you think about it, there are many issues we could be upset about and much more serious acts of disrespect than the 'non-lawyer' word (dropping work on us at the last minute, failure to say ‘thank you,’ failure to recognize achievements, failure to give raises, to name a few) so being offended by the term ‘non-lawyer’ may seem like a waste of energy. But is it perhaps the key to the whole issue of respect? If we were not ‘non’ employees, would we, instead, be more valuable employees? We do have to pick our battles. However, every movement toward improvement starts with the grass roots. If we (meaning all paralegals and other legal support staff) stop using the term 'non-lawyers' and, instead, use our proper titles, perhaps others will also. That may, in turn, increase respect for everyone in the legal environment. Give this some thought and be sure to leave a comment. I hope to hear from all of you. Is ‘non-lawyer’ a ‘non-issue’ or not? Lynne: I recently answered a similar question on the Paralegal Gateway listserv for a former journalist that is changing careers and is currently enrolled in a paralegal program. I cannot emphasize this strongly enough, but if possible, all paralegal students should work in the legal field while they are in school to start gaining that all-important experience required by most employers. I’m assuming that you have strong communication, keyboarding and software skills and are well-versed in all MS Word applications. If you cannot get your foot in the door in any paid entry-level capacity, such as receptionist, courier, legal secretary or administrative assistant, even part-time, I'd try offering your services as an unpaid intern, at least for a short period to get that crucial experience on your resume before you graduate. You might also want to investigate the possibility of temporary or contract work. Consider volunteering with a legal non-profit agency and joining your closest paralegal association to network and make area legal contacts. If you already know any area legal professionals from your previous career, call them! Now is a good time to prepare a solid one-page "functional skills" resume, emphasizing your current skills that are transferable to the legal industry. Also develop a writing portfolio with your best work from your current paralegal program. Vicki: Lynne’s suggestions are right on, Hardin! There are only a couple of things I would add. First, do join paralegal associations that offer student memberships so that you receive their publications and can participate in educational events. Usually those programs are offered at a reduced cost to students. This is an excellent avenue for networking with paralegals already working in the field. Second, it’s essential that you begin social networking now. Set up your profile on LinkedIn showcasing your experience and education. Then begin adding connections and joining paralegal groups. When you’re ready for employment, you can include that in your profile. The networking you do on LinkedIn (and also on other social media sites such as Twitter and Facebook) may help you land your first job. For more information on social media sites, see my articles ‘Why Tweet’ and ‘Are You Sabotaging Your Career’ in the article archives at http://www.paralegalmentor.com/. Listening to Podcasts such as The Paralegal Voice is a great start, Hardin. I would also suggest that you participate in forums such as Paralegal Gateway and Legal Assistant Today. Many students post comments and receive valuable career tips. We wish you the best, Hardin. Let us know if we can answer any other questions! I'm wondering if any of my readers have addtional suggestions for Hardin? Please leave a comment...and watch for the next episode of The Paralegal Voice. Stay tuned! Are you familiar with Vilfredo Pareto and the Pareto Principle? Perhaps you've heard of the 80-20 rule? Vilfredo Pareto was an Italian economist and sociologist who, in 1906, created a mathematical formula that described the unequal distribution of wealth in his country. Pareto observed that twenty percent of the people owned eighty percent of the wealth. Once Pareto made his observation and created his formula, others began to observe similar trends in their own areas of expertise. Dr. Joseph Juran, a Quality Management pioneer, was working in the US in the 1930s and 1940s when he recognized a universal principle he called 'the vital few and the trivial many." He appeared to be applying Pareto's observations about economics to his broader body of work. Thanks to Dr. Juran and his observation of the "vital few and trivial many," the principle that 20% of something is always responsible for 80% of the results became universally known as Pareto's Principle. You may be wondering how Pareto's Principle applies to paralegals. Before you head back to summarizing depositions or searching for expert witnesses, or whatever you have scheduled for today, let's examine just how Pareto's Principle applies to you and its value as an effective tool for managing your work and your life. Your ultimate goal should be to focus on the 20% (or the 'vital few') of the tasks that bring big results and to either stop doing the other 80% or begin delegating those if they must be done. If delegating is not an option, then determine what you will do in terms of importance. Your focus should always be on the 20% that is vital. Applying the Pareto Principle to space organization: If you're actually referring to only 20% of everything you file in your file cabinet, it's probably time to weed out the remaining 80% and to rethink what you are saving in the first place. If you are wearing only 20% of your clothes 80% of the time, doesn't it make sense to get rid of the 80% that is just taking up valuable real estate in your closet? If you are referring to only 20% of the books on your book shelf, a good plan would be to either give away or throw away the other 80% that is gathering dust. If you do this, you will be removing 80% of the clutter from your life. Applying the Pareto Principle to your association: When 20% of the membership of a group is doing 80% of the work, a great deal of stress is placed on volunteers. The solution may not be as simple as throwing away unused books because you do need all of your members. An alternative might be to increase membership so that you increase the 20% available to do the work. A better plan would be to delegate 80% of the work (which should be tasks that can be given to someone else) to the 80% who are not helping but who might pitch in if asked. Your challenge: How can the Pareto Principle apply to you? Identify the 20% of anything going on in your life or your work that has value and importance. The result will be the 'vital few' that should be your focus. The remaining 80%, the 'trivial many,' can either be handled by someone else, handled by you once the 20% is completed, or is unimportant and doesn't really have to be done at all. Apply this principle to the clutter in your life, too. Identify the 20% of your 'stuff' that has meaning and value to you, then remove the remaining 80%. This will allow you to enjoy the 20%...the 'vital few'... to the utmost. As for your group membership...let me know how that goes! Do you drag home from work and dread the thought of putting a meal on the table for your hungry family? Do you resort to take out and fast food instead? Planning: When you walk in the door from a long day of entering billable hours you have to know what you'll be fixing for dinner. If you don't, you will definitely resort to fast food, take-out or cereal. To know what you'll be fixing, you must have a plan. Breaking the work into manageable chunks: The task of fixing dinner seems overwhelming: too many steps and too much to do. If you look at cooking as one giant step, it's bound to seem overwhelming. If you break it down into smaller pieces, it becomes manageable. Take a few minutes over the weekend to decide what you'll be having for the next seven days, using your favorite recipes to fit into that schedule. Every evening after dinner, pull the protein for the next meal out of the freezer and place it in the refrigerator. It'll be ready to cook when you get home from work. When you arrive home the next evening, begin preparation of the protein dish. While that cooks, prepare your side dishes: a vegetable (either fresh, frozen or canned) or a salad and a starch (potatoes, rice or pasta. Voila! Dinner in thirty minutes to an hour, depending on your chosen recipe. You may also get a head start on the next night's dinner by browning a pound of ground beef or sauteing extra chicken breasts. Step 1: In a small saucepan, mix 2 teaspoons. cornstarch, 1/4 cup soy sauce, 1/4 cup apricot preserves, 2 tablespoons sugar, 2 tablespoons white vinegar, 1/8 teaspoon instant minced garlic, 1/4 teaspoon ground ginger and a dash pepper; cook over medium heat until think and bubbling, 2 minutes; Remove from heat, stir in 1 tablespoon orange juice and 1 tablespoon brandy (or 2 tablespoons orange juice). Step 2: Place skinless, boneless chicken breasts (enough for your family or more because this is a great leftover) in a shallow 9x13" glass baking dish. Pour sauce over top. Place in a 375 degree oven. Bake uncovered for 30 minutes; turn and bake an additional 20 minutes or until done. Step 3: While chicken bakes, make rice. I usually use 2 cups rice to 4 cups water (always the 1 to 2 ratio, whatever your amount) with 1/2 teaspoon salt. Cook about 20 minutes until done. Step 4: While rice is cooking, steam some fresh broccoli. That's it...a balanced meal is ready with very little work. You could make the sauce the night before and use leftover rice for even simpler meal prep and clean-up. Cook a ham or a roast, or make a big pot of soup, over the weekend so you'll have leftovers for one night. Here's my very difficult recipe for a Sunday roast: Purchase a chuck roast (no need for a better cut of meat) and 1 package of McCormick Brown Gravy Mix; rinse the meat and pat dry with paper towel; place in a roasting pan and sprinkle gravy mix over; cover, place in oven and bake slowly for 4 hours - basically all afternoon. Temperature will depend on your oven but I set mine at 275 degrees. That's it and, yes, you read right...do not add any liquid. Use only pans, utensils, mixing bowls and serving dishes that can go in the dishwasher. You may have to hand wash your knives but that should be it. Use aluminum foil liberally so that you may not even have to clean a baking pan. Some of my favorite sites for easy recipes are allrecipes.com, kitchenscoop.com and savingdinner.com. With this simple approach to meal planning and preparation, you should be sailing through mealtime, with time to spare to go for a walk, read that favorite book or watch some television. Every paralegal needs time to relax! I'd like to hear your ideas for simple, quick meal planning. Please leave a comment. If your employer provides you with a BlackBerry or other wireless device and expects you to be available 24/7...or basically on call for a response all the time...should you be paid for more hours than your normal work week? Pursuant to the US Department of Labor's Fair Labor Standards Act (FLSA), paralegals are considered to be non-exempt employees and, therefore, are entitled to be paid for all time worked over 40 hours in a workweek. That overtime pay is to be calculated at a rate not less than one and one-half times the regular rate of pay. Further, the FLSA expressly states that all time worked 'off the clock' is included in the calculation of overtime compensation. Is this a problem? A case filed on July 10, 2009 in the New York Eastern District Court by Miguel Agui, Alexander Reyes and James Gipson v T-Mobile USA will provide the answer. That answer will most certainly affect the compensation received by paralegals. Letting employers work remotely with wireless gadgets has a legal price tag tied to it. So warn employment lawyers, who say a recent proposed class action against T-Mobile USA highlights the dangers of letting employees go home with BlackBerrys and other handheld devices. In the T-Mobile case, filed on July 10 in federal court in the Eastern District of New York, retail sales associates and supervisors allege that they were not paid for "off the clock duties," such as logging into computer systems and responding to e-mail and text messages "all hours of the day." The complaint, Agui v. T-Mobile, alleges that these employees were issued T-Mobile smart phones and were required to review and respond to numerous T-Mobile-related e-mails and text messages both day and night, whether or not they were logged into T-Mobile's computer-based timekeeping system. The complaint also alleges that the employees were required to take and place T-Mobile-related telephone calls, participate on T-Mobile conference calls and work "off the clock" during scheduled lunch breaks. "This case is a good reminder of why every company should make sure that its payroll practices keep up with the fast pace of technological change and capture all work-related activities, whether they occur at work, at home, or via new channels of communication like BlackBerrys or text messaging," said David Barron, a management-side lawyer in the Houston office of Epstein Becker Green Wickliff & Hall. "Putting aside the merits of the case against T-Mobile, this case illustrates the legal implications of introducing technology into the workplace, especially when used by nonexempt employees to work remotely." • Implement a clear "off the clock" policy requiring employees to report all work time regardless of where and when it occurs. • Train supervisors never to request an employee to work off the clock. • If issuing BlackBerrys or remote-access technology to nonexempt employees, consider providing an acknowledgment form noting their obligation to report all work time. Brent Pelton of the New York employee-rights firm Pelton & Associates, who is representing the plaintiffs in the T-Mobile case, said he hopes his lawsuit sends a message to employers. "Make sure that you have a very strong policy about compensating employees for all hours worked," Pelton said. In the T-Mobile case, Pelton said, employees were motivated to work off the clock to get commissions. He said that T-Mobile required its hourly sales associates to take and return telephone calls, e-mails and text messages from customers and co-workers while off the clock. T-Mobile has not yet responded to the suit. T-Mobile officials were not available for comment. The lawsuit was brought as a nationwide, opt-in collective action consisting of all persons who are or were employed by T-Mobile USA Inc. from July 10, 2006, to date as retail sales associates and supervisors. Paralegals will certainly be watching the outcome of the matter of Agui v T-Mobile and its effect on the bottom line: their paychecks. The first episode of The Paralegal Voice, “New Hiring Trends in the Paralegal World”, that I co-host with Lynne DeVenny, is now available at Legal Talk Network and at iTunes. Do you have a question, comment or request for a future show topic? Send them to TheParalegalVoice@gmail.com. Productivity...everyone wants to know how to get more done in less time. Getting more done in less time isn't the answer, though, and neither is drinking copious amounts of caffeine. The answer is to take steps to be your most productive ... to eliminate all those things that slow you down. 1. Determine when you do your best work. When are your energy levels at their highest? Early in the morning? Later in the day? Everyone is different but it's really easy to figure out when you do your best work. Once you know that, you should plan to do work that takes your highest energy levels during the time when you feel your most productive. Plan tasks that don't take so much energy for the time when you're slowing down. Drafting briefs or preparing deposition summaries requires high energy so do them when you're at your best. Returning telephone calls and answering email can be done when you're energy is ebbing. Have your calls held while you're doing your high priority work that takes total concentration. This works best if you have a good voice mail message that informs callers when they can expect to hear from you and, also, elicits enough information so that you can be prepared when you return the call. Don't be the Candy Magnet. If you keep candy on your desk, you're inviting people to stop by any time, regardless of what you're doing. If you have M&M's, I'll be the first one there! Close your door. This sends an instant message that you don't want to be disturbed. Arrange your office so that you're not visible from the hallway...and make it so that it's not so comfortable for chatting. Stack a few files on the guest chair...if they can't sit down, they won't stay long. Don't stop yourself to read every email when it comes in. Instead, schedule a time when you'll check email and stick with it. First thing in the morning, at noon, and again about 4:00 pm should be adequate. You may have to shut your email program down entirely to avoid the temptation. Telephone time should also be scheduled. Plan to return calls just before lunch (people will be ready to leave and won't talk long) or later in the afternoon. Prepare ahead for the calls so that you get right to the point and take care of the business. If you need a recipe, you should make that call on your own time. Keep your desk stocked with all the supplies you need so you don't have to replenish them during the day. It's easy to have legal pads, file folders, stationery, pens, staples, and other supplies on hand within easy reach. 4. Everything doesn't have to be perfect. Perfectionism is a nasty time waster and will paralyze you... you may be reluctant to start because you desperately want to do a perfect job...or none at all. There is a time to be perfect (as in the finished product) but trying to prepare a perfect first draft is a waste of time. The early stages of a project isn't the time to worry about getting everything right. The editing, rewriting and double-checking of facts and citations can be done at the end of the project. Some tasks deserve or require more perfectionism than others. For instance a brief must be clearly written and well-polished. Applying the same energy to a letter or a memo is probably not the best use of your efforts. While some degree of perfectionism is necessary to do a good job, there is a difference between perfectionism and excellence...this is recognizing when good is really good enough. 5. Stop procrastinating. Procrastination will also paralyze you. When you can’t get started on a project...whatever your reason...you’re not producing. Everyone procrastinates sometimes. The interesting thing about procrastinating is that only you know when you're doing it. You get a cup of coffee, stop by a friend’s office to chat, check your e-mail, call your Mom, or even work really hard on a low priority project – all methods of procrastination. Here are a few tips for overcoming procrastination. You may delay starting a project because you won’t have time to finish the whole thing at one time. This all-or-nothing thinking isn’t good because we rarely have large chunks of time to work on a project. The best way is to break the project down into smaller parts and work on just one part at a time. Sometimes you procrastinate because you can’t start at the beginning so you lose sight of the fact that starting anywhere is better than not starting at all. While it’s great to start at the beginning this isn’t the only logical way to work because most projects have many good places to start, and all of them are about as good as the other. Just take the first step: start anywhere. Work no more than 15 minutes at a time. This is a great anti-procrastination method. Set a timer and work full blast on a project for the next fifteen minutes. When the timer goes off you can choose to do something else for fifteen minutes or continuing working on your project. Most of the time you'll have momentum going and just re-set the timer and keep on working. It’s easy to work for hours this way but it doesn’t feel that long because you always know that a break is just 15 minutes away. Start even if you’re not in the mood. The inspiration to work on a project is not always with you but if you wait for inspiration, you’ll never start. It’s better to begin the work and see if the ideas start to flow. Unpleasant tasks don’t get any easier if you put them off...in fact, they get worse. And the worry over not working on a project takes as much energy as just biting the bullet and getting started. Think about taking a swim in very cold water. Some people prefer to dive in quickly and get the shock over with. Others stretch out the agony by stepping in inch by shivering inch. It's really easiest to plunge in and get the agony over with as soon as possible. Your challenge: Think about how your actions are reducing your productivity. Once you've identified an issue, decide what steps you need to take to fix it. Then spend the next month practicing those steps. By this time next month, the steps will have become a habit and you'll find yourself well on the way to boosting your productivity. 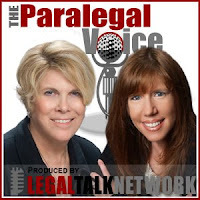 Lynne DeVenny and I are pleased to be a part of The Paralegal Voice, a new monthly podcast for paralegals at LegalTalkNetwork. The show will focus on key issues for the paralegal profession. We know that many paralegals and paralegal students are concerned about the economy and its effect on job security and hiring, so we’re very excited about the first podcast: “Hot Specialty Areas for Paralegals.” We’ll be talking with Chad Volkert, Executive Director of Robert Half Legal, about the latest hiring trends and what you need to know to get the most in-demand jobs now – and in the future. In addition to hot specialty areas, we'll also discuss education and software skills requirements. The Paralegal Voice is for paralegals and about paralegals, and we’re counting on you to be part of the dialogue. Questions, comments and requests for show topics and guests are welcome and can be emailed to TheParalegalVoice@gmail.com. Best of all, The Paralegal Voice is free and you can listen to the podcasts at your convenience. We suggest that you subscribe to the podcast by either going to LegalTalkNetwork or to the podcast directory at iTUNES! so you’ll receive each new edition as soon as it's released.